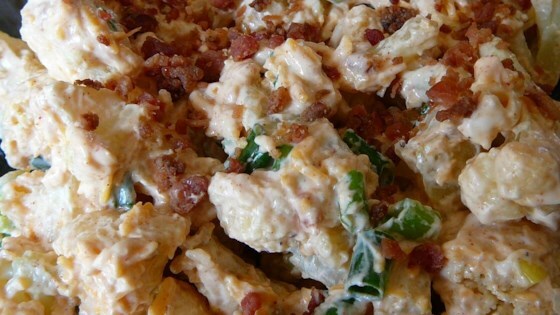 "A lower in carb version of my favorite baked potato salad. Most people when I serve this can't tell right away that this is made with cauliflower. Even my cauliflower hating husband enjoys this salad!" Place the bacon in a large, deep skillet, and cook over medium-high heat, turning occasionally, until evenly browned, about 10 minutes. Drain the bacon slices on a paper towel-lined plate. When cool, crumble into bacon bits. Preheat an oven to 400 degrees F (200 degrees C). Line a baking sheet with foil. Combine the cauliflower, olive oil, garlic, salt, and black pepper in large bowl. Spread the cauliflower on the foil-lined baking sheet, and roast in the preheated oven until the cauliflower is lightly browned, about 15 to 20 minutes. Cool. Place the cooled roasted cauliflower, sour cream, and mayonnaise in a large bowl; stir. Fold in the shredded Cheddar cheese, bacon bits, green onion, chives, pepper sauce, and paprika. Adjust salt and black pepper. Refrigerate for 1 to 2 hours before serving. Mashed and baked cauliflower with sour cream and cheese. If you have the time, this is also good with a homemade dry ranch dressing mix stirred into the sour cream and mayo before mixing with the cauliflower. If you like more or less mayo and sour cream, start with a 1/4 c. more or less than what the recipe states. The choice in cheese is all up to you, too. I like using white Cheddar because I like the bite that it gives to the salad. It's all personal taste so have fun with the recipe! Baking time may vary depending on how done you want your cauliflower. We like this salad best with BBQ'ed chicken or fish. No need for the bacon, I'm going to make this, but with vegan sour cream and vegan cheese for a low carb, zero cholesterol salad.